For those of us who work with data, we get used to visualizing in our mind and develop an intuition for it. For everyone else, data visualization usually takes the form of a diagram on a small, two-dimensional screen. Standard data plots can take an exciting idea and turn it into something boring, or even worse, drudge up memories of panicked high school math exams. This experimental data sculpture attempts to draw the viewer into the visualization and connect them with the data on an intuitive, physical level. The sculpture shows the amount of coverage the U.S. mainstream media gave to Net Neutrality between January 2014 and April 2015, while the FCC was creating revised Net Neutrality rules. 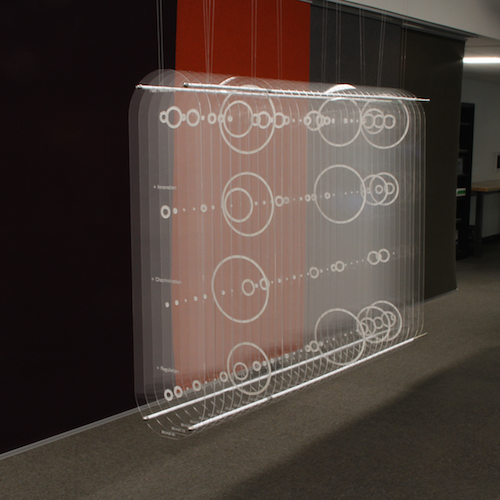 Each of the 33 panes of clear acrylic represents a two-week time slice, with the size of an etched circle corresponding to the amount of coverage. The top row shows total Net Neutrality coverage, with the other three rows representing coverage of "innovation," "discrimination," and "regulation," in reference to Net Neutrality. Attention peaks four times: when the FCC announces its proposal, at the end of the public comment period, after President Obama announces support for reclassifying broadband, and finally when the FCC releases its new regulations. Coverage is notably low during the public comment period, the primary time individual citizens had a chance to influence the policy. The visualization also shows that "discrimination," language used in earlier technical and legal discussion of Net Neutrality disappeared from mainstream media coverage, giving way to the more idealogical and economic terms "innovation" and "regulation." The viewer can explore these data by walking around the sculpture, standing back, or standing close, making it easy to engage without a digital interface or specialized knowledge. When the FCC released it's 2014 Open Internet proposal, the MIT Media Lab formed a working group to make an official statement. I was one of the contributors, and I think we produced an insightful document on the importance of Net Neutrality. New Work from the Center for Civic Media from MIT CMS/Writing on Vimeo. A bunch of spectacular 5 minute updates on 2013—2014 research projects from the Center for Civic Media, where I work. Mine are at 11:00 (What We Watch) and 26:05 (Media Meter), but they're all wonderful. Ed Platt: "How to Make Bread" from MIT CMS/Writing on Vimeo. I gave an "icebreaker" ignite at the 2014 MIT/Knight Civic Media conference. The theme was "The most interesting thing I learned this year" and I talked about how to culture your own yeast to make bread. My undergrad physics thesis, supervised by Edward Farhi. Link. In January of 2005 I participated in the Snowflake-A-Thon hosted by the Simplicity group at the MIT Media Lab. The challenge was to write the simplest program that produced the most beautiful snowflake. You can see the gallery of all the snowflakes and a video of mine here. Update: The gallery is no longer available on the Media Lab site, but you can see my video below. My program created a hexagonal grid, and assigned a number to each hexagon. The center started as "1" and the rest started as "0". 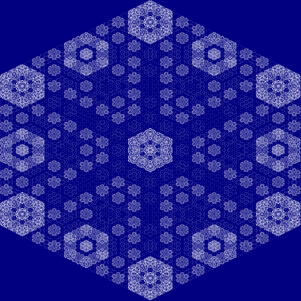 After every time step, the value of each hexagon was added to each of its neighbors, modulo 32. I ran the code for a few time steps and then mapped the numbers to a gradient from dark blue to white. I got the idea from playing around with 2d cellular automata on a hexagonal grid when I was in high school. I thought the resulting snowflake was really nice. Apparently the Simplicity people thought I was a total weirdo for coding a snowflake in MATLAB, but I remain pleased with the results.